Located in Allentown, Pennsylvania within the Zion’s United Church of Christ facility, the Liberty Bell Museum is a nonprofit organization and public museum celebrating the history of Pennsylvania’s role in the American fight for independence and commemorating an iconic American landmark. The Liberty Bell, which serves as one of the most iconic landmarks of American independence and history today, was originally commissioned for creation in 1752 by the Pennsylvania Provincial Assembly. Constructed by London’s Whitechapel Bell Foundry, the 12-foot bell, which weighs more than 2,000 pounds, was cast with a reference to the Biblical Book of Leviticus and was famously cracked upon its initial ringing once it arrived in Philadelphia. Though the bell was initially used to call legislators to order and to announce civic meetings and proclamations, it is assumed to have been famously used in July of 1776 to announce the reading of the country’s Declaration of Independence. Though its historical accuracy has been called into question, an 1847 short story about the bell’s ringing following the vote for independence brough the bell’s reputation to national historic attention. During the American Revolutionary War, the bell, along with 10 other similar structures, was taken down from its public display and hidden at Allentown’s Zion’s Reformed Church, in order to prevent it from being stolen and melted down by British forces for cannon casting. In 1778, following the end of British occupation of America, the bell was restored to its public display in Philadelphia. In 1962, proposals for a museum commemorating the Zion’s Reformed Church’s role in the American Revolutionary War were introduced by members of the Allentown community. Though the church facility was nearly lost in the late 1960s as the result of proposals for the construction of Interstate 178, civic opposition resulted in the cancellation of the freeway project and the preservation of the church as a historic museum facility. The church’s underground area was excavated in preparation of museum creation, exposing its original foundations and the area where the Liberty Bell had been stored during its hiding. Today, the Liberty Bell Museum recognizes the significance of the historic American landmark and the role of Allentown and the Zion’s Reformed Church in preserving it during the American Revolutionary War. The museum is operated as a nonprofit organization, offering a variety of exhibits and public programming related to American independence and civic history. It also serves as the official headquarters for the Allentown Flag Day Association organization, the oldest incorporated civic organization of its kind anywhere in the United States. The church itself serves as a living history museum exhibit, listed on the National Register of Historic Places for its role in American civic history. As Allentown’s first church facility, the church was used as a refuge area during conflicts with indigenous tribes prior to American Declaration of Independence, and later served as a hospital facility during the Revolutionary War and a gathering site for official proclamation readings and civic events. Regular church services are held at the facility weekly, with special historic commemorative services offered quarterly. Exhibits at the museum include an exact replica of the Liberty Bell, which is offered as a hands-on exhibit that visitors may ring. 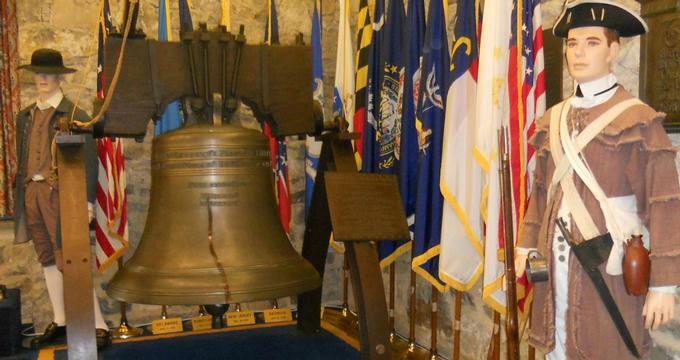 The city’s own liberty-style bell, which was cast in 1769 and served a similar civic purpose to the Philadelphia bell, is also on display, along with a variety of permanent exhibits related to the American Revolutionary War, the First Defenders, and the American colonial period. A rotating exhibit also showcases artifacts related to Lehigh County civic and social history, and a child-size Conestoga wagon replica is offered for play for young visitors. The museum is also home to several other large historic artifacts of note, including a handpainted mural by artist Wilmer Behler recounting the hiding of the 11 bells during the Revolutionary War. The Pip the Mouse puppet, acquired by the museum in 2003, serves as an iconic pop culture landmark of the Allentown community, formerly used in a holiday puppet show at Hess’ department store between 1962 and 1995. The popular Mouse Before Christmas character became a popular fixture among local advertising and marketing campaigns and gained a reputation as a beloved children’s holiday favorite character throughout the late 20th century. Following the department store’s closure, props and pieces from The Mouse Before Christmas were donated to local community theater organizations, and the mouse puppet was donated to the museum in 2003. A variety of public special event programming is offered at the museum, including periodic historic reenactment events related to American independence and the Revolutionary War. A lecture series is offered at the museum showcasing topics on American and local civic history, held as part of the city’s Third Thursday event series. Full reenactment presentations of The Mouse Before Christmas are presented at the museum throughout the holiday season, and a Pip’s Pals Club offers family special events and discounts on museum gift store merchandise.